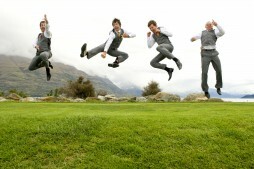 Queenstown, New Zealand provided the perfect stunning backdrop for another fantastic wedding last weekend. Eryn, a kiwi local and Kirsty, originally from the UK celebrated their many years of love by throwing a wedding bash that their friends and family will not soon forget! From adorable little groomsmen to fun party box props, this couple committed to making their wedding day personalised and it turned out absolutely perfect! Congratulations Eryn & Kirsty….keep the good times rolling!